It’s lovely! What kind of yarn did you use? I love how think it is. And is that half crochet stitch or singles? 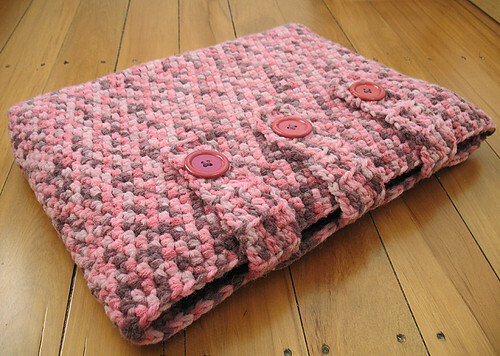 I love how the variegated yarn made each stitch a different colour – what a wonderful effect. This is just lovely! I don’t get variegated here . I am going to try holding different color yarns together. OooOoOOh the laptop cover is divine! So where do you carry the cables and mouse and other stuff? That is just amazing!! Im new to crochet and am looking for ideas…i know you said you dont have the pattern but if you ever remember it please post it. Thanks. If you ever get around to putting the pattern to paper, please share! This is lovely!!!! it’s wonderful i try to make a cover for my laptop too. i find the reference.